Why did you choose the PGP-BABI program? I come from a mechanical engineering background and after graduation, I worked in the automotive industry for a while. After that, I worked in the education industry and then decided to shift into analytics. I was looking for programs that were available in the market and based on my peers and friends suggestions, I realised that the PGP-BABI program by Great Learning was one of the best programs that I could have gone for. This happened when I was in the education industry. I used to manage a territory where I had to develop good business outcomes. Basically, the target was to get more business in less time. And practically, I couldn’t find any feasible solution in front of me. The only thing that I had access to was loads and loads of data. When I started crunching the data using Excel, I was unable to get faster outcomes and I realised that maybe I would need other tools that could help me to turn things around faster. And moreover, I also lacked the required knowledge. As I started digging deeper, I realised that I should go for formal training that could help me in turning around the data into goldmines. What did you like the most about the program? PGP-BABI program is a perfect blend of both knowledge and skills. Every concept was followed by a practical assignment, case study, or a quiz. The program enabled me to think beyond the simple learning tools of the trade and inculcated the ability to think from a business perspective. Being taught and mentored by some of the best individuals in the industry and academics ensured that my knowledge and skill grew simultaneously. 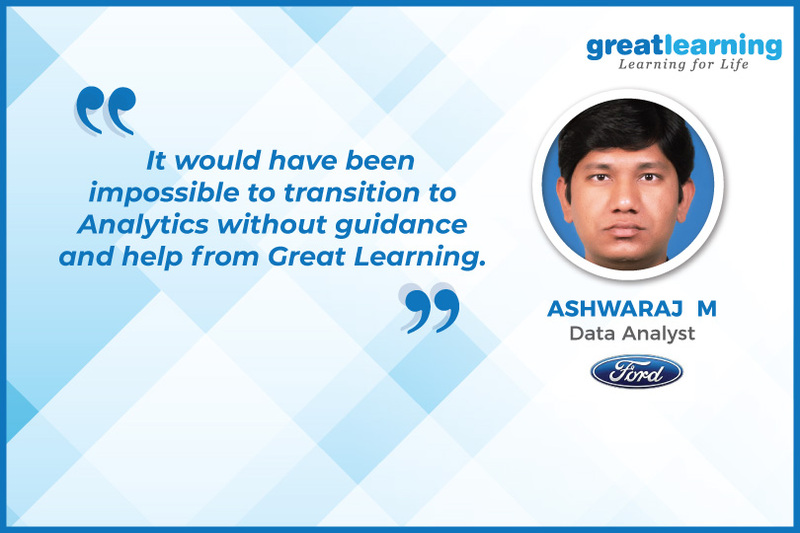 I can humbly say that without the guidance and help from Great Learning, my transition from Education to Analytics would have been impossible. When I was joining this course, I found a relevant contact in the automotive industry. I also spoke to a few professors who came to Hyderabad. There was a marketing professor, he mentioned that Ford was looking for analysts and I should try for it. When I was about to complete my course, one of the alumni with whom I had worked in Mahindra offered me a job in Ford and the rest, as they say, is history. How did you manage to learn with a full-time job? It was a little challenging in the beginning because my job required me to be on the field most of the time. But after proper planning and talking to my company stakeholders, they were cooperative as I was able to show immediate benefits that I was getting out of learning. I also became more organised as time passed. In a way, I was able to learn time management as well with Great Learning. What advice would you give to the aspirants? I would say, one should keep three things in mind. First, take the course very seriously because the more serious you are towards the program, the better are the outcomes. Second thing is to have an open mind when classes are happening, even online classes. Just go through the recordings again and get an understanding of the content. The third and the most important thing is that when you are given assignments and quizzes, do them deliberately and only for yourself, not for others. These three things will definitely help in churning out the best outcomes from the program.